The MISS JANE AUSTEN BOOK CLUB will discuss Evelina by Fanny Birney. 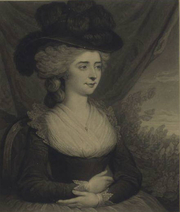 Frances "Fanny" Burney was the daughter of a well-known musicologist. She basically educated herself at home by her reading, and began writing at age 10. Her home in London was a center for musical gatherings attended and performed by elite English and European artists and musicians, and Fanny observed and moved easily among these personalities. She became an extremely popular and bestselling author whose works were admired by Samuel Johnson, Hester Thrale, Richard Brinsley Sheridan, and many other literary lights. Her first novel Evelina (1778), proved to be her greatest success and is still read today. In 1786, she was given a post at Court serving Queen Charlotte. She met and married a French exile, General Alexandre d'Arblay, and went with him to France, where she lived for 10 years. She's sometimes referred to as Madame d'Arblay. After her husband's death in 1818, she returned to London. An edition of her journals and letters in eight volumes was published in 1972–1980. Fanny Burney is currently considered a "single author." If one or more works are by a distinct, homonymous authors, go ahead and split the author. Fanny Burney is composed of 15 names. You can examine and separate out names.